My name is Steve Durrant and I live in Zimbabwe. I have been collecting, keeping and studying snakes for over 42 years. I imported snakes on an exchange basis from the USA and Moscow Zoo in Russia twice, back in the late 80’s, some of which I have still got today including rainbow boa, king snake, milk snake, Indian spectacled cobras, Russian Pit Vipers and copperheads. I ran and was chairman of the Herpetologoical Association of Zimbabwe for about 15 years until about 2003 and published Newsletters 3 or 4 times a year. Unfortunately the Association didn’t survive the Zimbabwe dollar collapsed. I have a large collection at home of about 150 snakes in total. As while as a mice breeding program and rabbits for the bigger snakes. I have purpose built snake pens outside for larger snakes. These are made out of brick with a small pond, foliage and glass sliding doors. There are about 9 in total with a large one for the pythons and boas. The snake house consists of a large number of snake cages made of wood with a glass sliding door on the front. Much like today’s vivariums but all hand made as no such shop exits for them over here. I run heaters in all the cages during the winter months where the snakes and choose to curl round them if they so wish. I have had a few nasty bites over the years like most snake handlers. One from a Black Mamba that had me in intensive care for 3 days and another more recent one from a cobra. It was a dry bite but unfortunately went septic which ended up being just as dangerous. A few other swollen limbs and fingers but currently still sporting all digits. 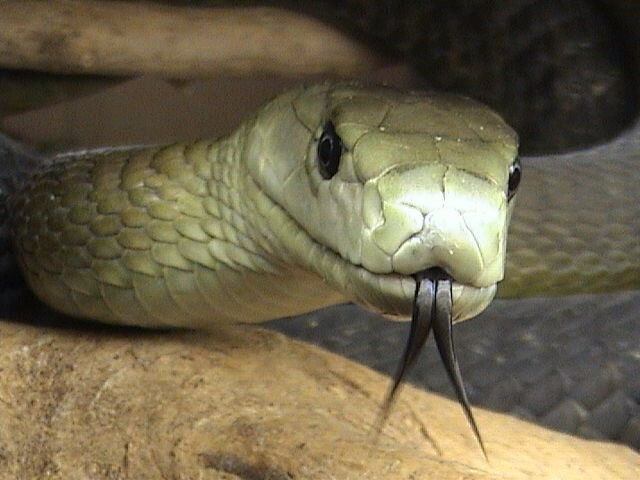 The picture below is of Angus who is my black mamba and I have had him for about 23 years.